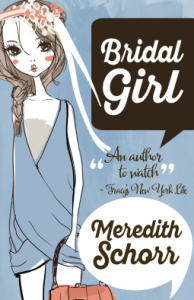 This was the third book that I read and the third book in the series "Blogger Girl". I have thoroughly enjoyed this series and looked forward to reading this one. However, this one was not my favorite. For me, this one seemed pretty cheesy with a lot of hokey mixed in. Just a little too much for me. Especially the bachelorette party scenes. My first thought when Kim received those texts and especially the picture text from Nicholas was that the men at his bachelor party got hold of his phone. However, Kim went off on a tangent that the man she was going to marry in a week would send those to her. Seriously? This part just rubbed me the wrong way. There were, however, lots of laughs and the tiring bickering between the sister and sister-in-law was somewhat funny, but got old fast. It left me wondering why this smart girl was acting so dumb. Possibly it was her wedding nerves and I can see that and I understand that. However, for me, the constant worrying just seemed to get in the way of all the fun times. As I said, it was still a decent read and I will pick up the next one because I know the fun times and the outrageous antics will be there. I just think the worrying took up too much space. Or it could be that I'm just old and don't remember all those frustrations and silliness while being young. Kudos to the author and thanks to Henery Press and Net Galley for providing me with a free e-galley in exchange for an honest, unbiased review.